Filed to: Toyota Celica GT.Filed to: Toyota Celica GT. 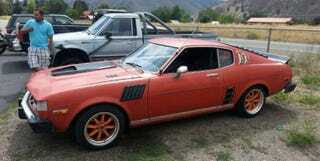 Japanese sports cars from the 70's look to be the next collector market. I'm partial to the classic Celica as it has the JDM goodness combined with some pony-car attitude. This particular Celica on Craigslist could use a good home and a lot of adhesive remover. The ad doesn't say much other than it has a 5-speed, so you don't have to worry about a manual conversion. It does run with "no problems." The title is "clean," though I wish I could say the same about the body and the paint is "original" but faded. Oh...and he or she is asking $5000 OBO, but they must sell it ASAP.